The project, called Safety First, is by Vladimir Walker. It projects a (very narrow) bike lane as well as a blinking bike icon in front of the bike, giving city bikers a little space to themselves on even the most bike-unfriendly street. Though while this is great for errant pedestrians who wander in front of you, hopefully the next iteration will also project the bike lane behind you, so that cars gaining on bikers from the rear see the bike lane surrounding them. 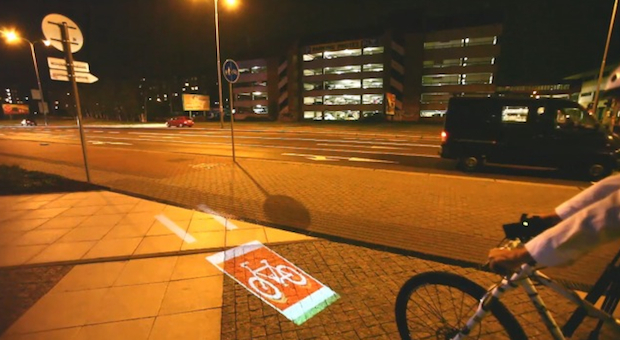 That rear-facing projected bike lane was the idea behind LightLane, a much-heralded project from 2009 that seems to have gained no traction despite becoming a major Internet hit and getting from concept to prototype stage. How much defense you would have in claiming you were biking in a bike lane of your own invention remains a question, but there is clearly a market for a glowing bike lane you carry with you. Someone simply needs to deploy it to let the cash start rolling in.